Snowy Day is a classic Icelandic design pullover for babies and toddlers, a sweater pattern you’ll knit over and over for baby gifts. Unisex for boys and girls, easily passed down to the next wee one, and will fit for more than one season with its boxy design and sweet hems. Spirit, new hat pattern for winter, and probably the warmest hat ever. With its cables around the ears and expanded top, it’s snug and roomy at the same time. Top off with a faux or real fur pom pom, (sources provided) or make one from wool. Oliver & Olivia Baby Sweater is a generously styled unisex baby jacket in the vintage sacque genre. Pattern is written for baby boys and girls in two sizes: 6-9 months and 12 months. Purchase it here for $7.95. 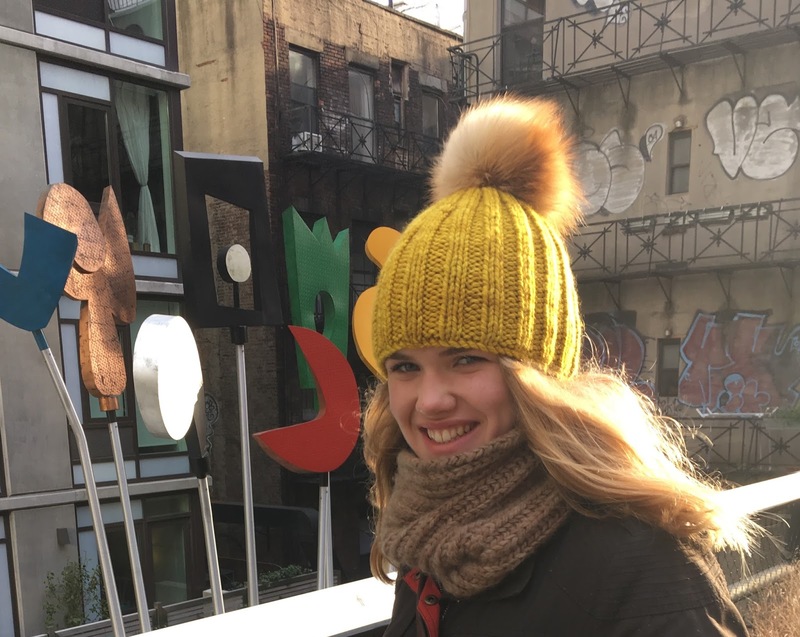 High Line fur pom pom hat and cowl pattern, two patterns in one for 2016. Both knit with chunky/bulky yarn. One adult size. ‘Toque times two’ hat pattern for the whole family. Written knitting pattern in child and adult sizes with no-itch cotton interlining, knit a sturdy stocking hat pattern that will last for years. A 3-page instant download pdf. $6.95 on Ravelry. 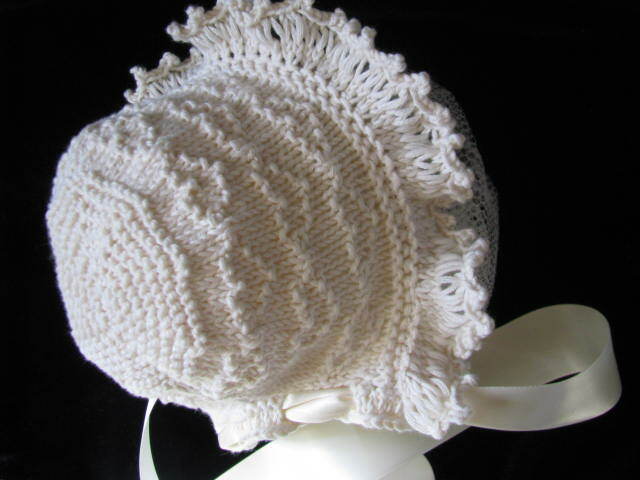 Charity baby hat pattern, easy enough for beginning knitters. It’s a quick project, using 2 strands of yarn. 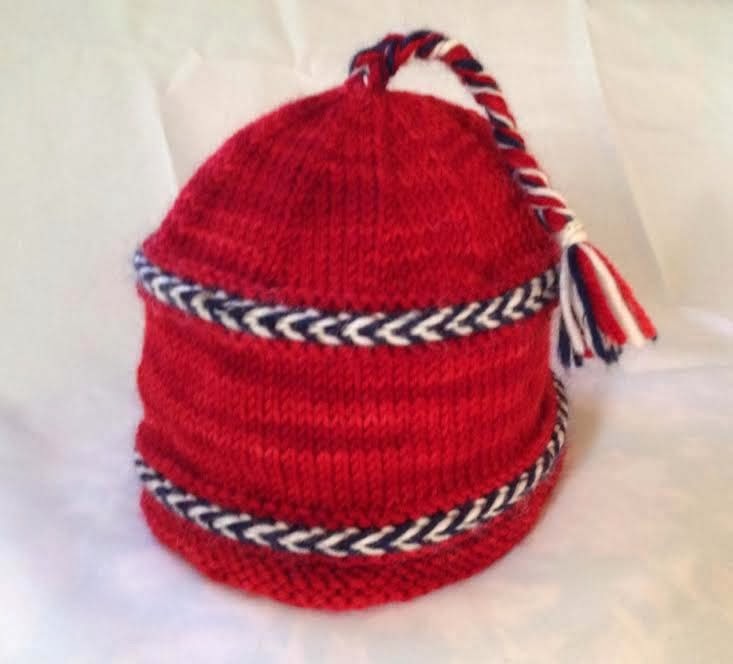 A versatile hat knitting pattern that will fit all babies. A free pattern, you can find here. 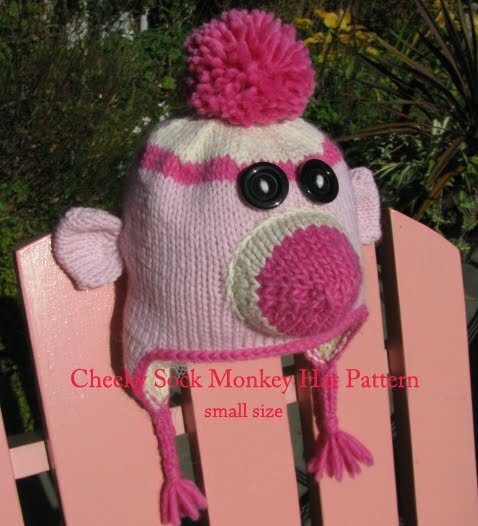 Sock Monkey Hat knitting pattern for baby and toddlers – finished measurement is 16″(41 cm) unstretched and unblocked. 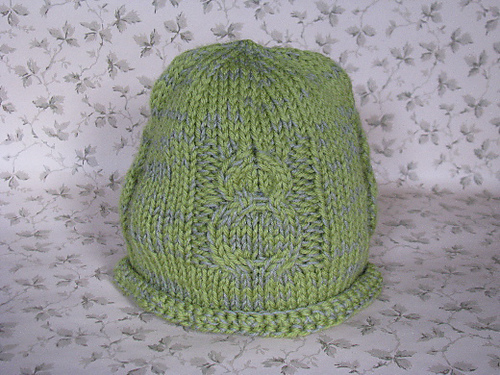 Knit in the round with lined earflaps and brim. 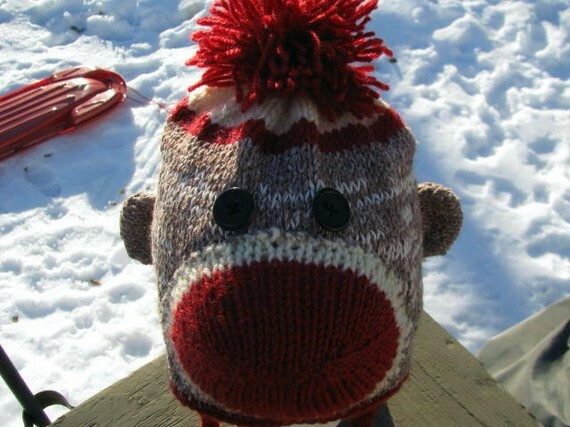 Construction of this smaller size sock monkey hat is different from the original hat pattern above. Pattern is 7 pages with detailed photos and knitting instructions written in American English. For immediate download $5.95 on Ravelry. Lace and picot edging make this little bonnet sprinkled with hearts a vintage-style creation that suits any christening or baptismal day, almost any special celebration or just for everyday carriage rides and little girl babies. Written pdf pattern with detailed instruction and photos sent to your specified email address, the baby bonnet knitting pattern accommodates two sizes: newborn to 6 months, and 6 – 12 months. Knit with DK organic cotton yarn. Available on Ravelry as an immediate download or Craftsy for $6.95. 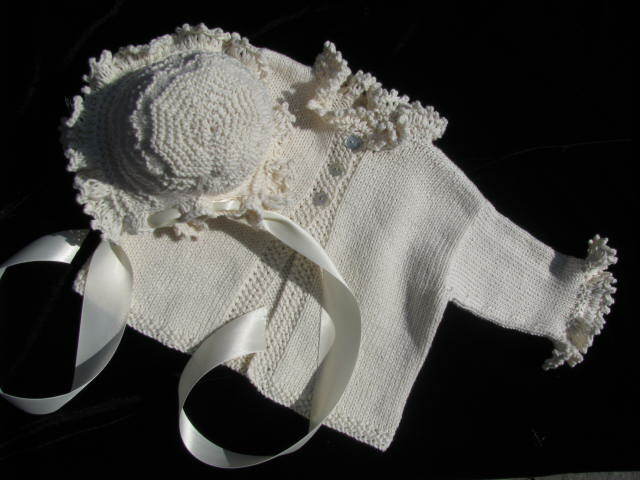 SAVE and purchase the Fancy lace baby sweater and bonnet patterns as a set. 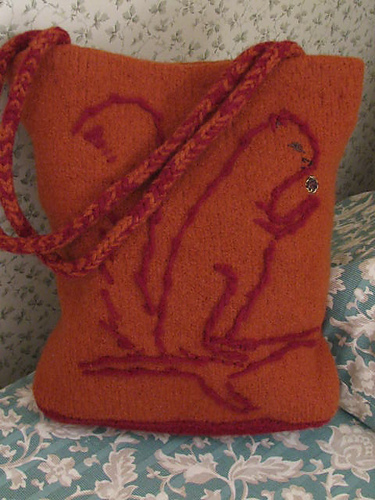 Felted Hobo Bag, a free knitting pattern, lined and embellished with a squirrel. 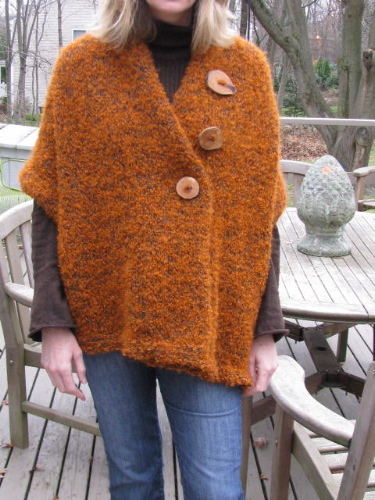 A popular easy shawl knitting pattern, written after being seen on the Today Show with Hoda and Kathy Lee. 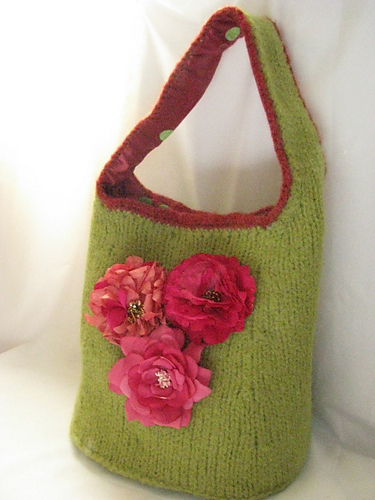 It’s a free pattern and you can read about it and download the schematic here. All Wattery Totteries patterns are ©Sharon Watterson and for personal use only. Finished products knit from these patterns cannot be resold. Please do not reprint, email, share, fax, or exchange by any method. All photos are the express property of Sharon Watterson.